An Israeli human rights group charges that Israel's military court system for Palestinian suspects in the West Bank produces almost automatic convictions. A report by the Yesh Din organization found that in 2006, more than 99.7% of those accused are found guilty, some 95% of the cases end with a plea bargain and the average hearing is just two minutes long. Yesh Din, which said that its inquiry was the first of its kind, found major failings in the court's due process: Hearings were held in Hebrew and the Arabic-speaking suspects often did not understand the charges brought against them, they were unable to present a full defense or have an effective counsel. "Most are detained in Israel and their attorneys are not able to meet them," said Michael Sfard, Yesh Din's legal counsel. In addition, minors were often tried as adults and detained at length before being charged. Sfard said the 0.29% acquittal rating in 2006 (23 out of 9,123) was most jarring. "We think that this is an outrageous number which clouds the presumption of innocence," he said. "It is unreasonable that a justice system will have such a low figure of victory of the defense." The army said it had not been provided the full Yesh Din report and could only respond to an initial draft. Still, the army said in a statement, the report was filled with flaws, faulty research methods and mistaken analysis. The army said its court system operated with full disclosure and stressed that defendants were provided fair trials, hearings had simultaneous translations and defendants were provided with all the material against them in advance. The military courts were established after Israel conquered the West Bank and Gaza in the 1967 war to administer Palestinians charged with security-related and criminal offenses. 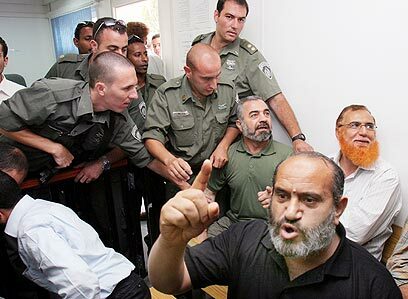 More than 150,000 Palestinians have been prosecuted in these courts since 1990, and about half the 9,000 prisoners currently being held in Israel were sent to prison by the military courts, according to Yesh Din. Yesh Din's board includes Michael Ben Yair, a former Israeli attorney general, retired Gen. Shlomo Lahat, a former Tel Aviv mayor, and Shulamit Aloni, a former cabinet minister. Two weeks ago, the group faulted the military for not opening enough investigations into allegations of mistreatment of Palestinians. The Israeli military launched 207 investigations into troops' suspected crimes against Palestinians in 2007, up 36% from the year before, the military said. See all talkbacks "Report: Israeli military courts automatically convict Palestinians"